The phonebook of the Motorola Atrix HD is mostly a standard Android ICS affair. The only addition to it is the Yellow Pages integration, which allows you to search businesses and people in the United States. The middle tab is the default one and it's where your contacts are listed. Contacts get displayed with a name and a picture to the right. They can be sorted by first or last name and displayed with the first or last name first. The other two tabs in the phonebook are Groups and Favorites. Groups are listed by service (e.g. your Gmail account), while favorites are a listed as a grid of large contact photos, which is really thumbs friendly. There's a permanent scroll bar available that you can grab and drag to jump straight to contacts starting with a certain letter. There's a regular search field, too. While editing a contact, you can add new fields of different types to fill in more info for the contact. You can link contacts too, if you've added the same person on multiple services. 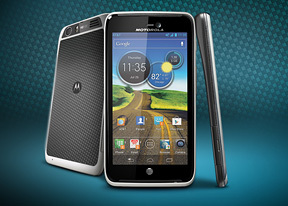 We didn't experience any issues with the signal and call quality of the Motorola Atrix HD. As expected, the phone did a commendable job on this instance. Smart dialing is enabled on the handset, which is great as it saves you the effort of going into your phonebook to find a contact. It shows only one matching contact at a time - you can use the down arrow to reveal the other suggestions. The recent calls tab is straightforward in terms of functionality. The favorites tab is neat, as it allows you to dial the contacts with a single tap. Text messaging is a pretty standard ICS affair. All SMS/MMS communication is organized into threads - each thread consists of all messages between you and one of your contacts. You can select multiple threads to mass delete them. Each thread is organized like an IM chat session, with the latest messages at the bottom. You can manage individual messages (forward, copy, delete) and even lock them (to prevent deletion). You can use search to find a specific message in all conversations. You can add multimedia (photos, videos, sounds, etc. ), which will convert the message to an MMS. If you need multiple slides or multiple attachments, you can go to a full-blown MMS editor as well. The Gmail app supports batch operations, which allow multiple emails to be archived, labeled or deleted. The app supports multiple Gmail accounts, but there's no unified inbox for other email services. Google Talk handles the Instant Messaging department. The GTalk network is compatible with a variety of popular clients like Pidgin, Kopete, iChat and Ovi Contacts. You are presented with two text input options out of the box. The first one is the standard Android ICS keyboard which is really good. The popular Swype keyboard is also preinstalled. In case these two don't cut it for you, the Google Play store is full of options.